puran poli recipe | how to make puran poli | maharashtrian pooran poli with detailed photo and video recipe. a popular maharashtrian sweet flatbread recipe made with wheat flour and sweetened chana dal stuffing. it is generally made during special occasions or during festival time, but can be made and preserved at any time. it is eaten or served warm with generous amount of ghee but also tastes great with pickle recipe. puran poli recipe | how to make puran poli | maharashtrian pooran poli with step by step photo and video recipe. 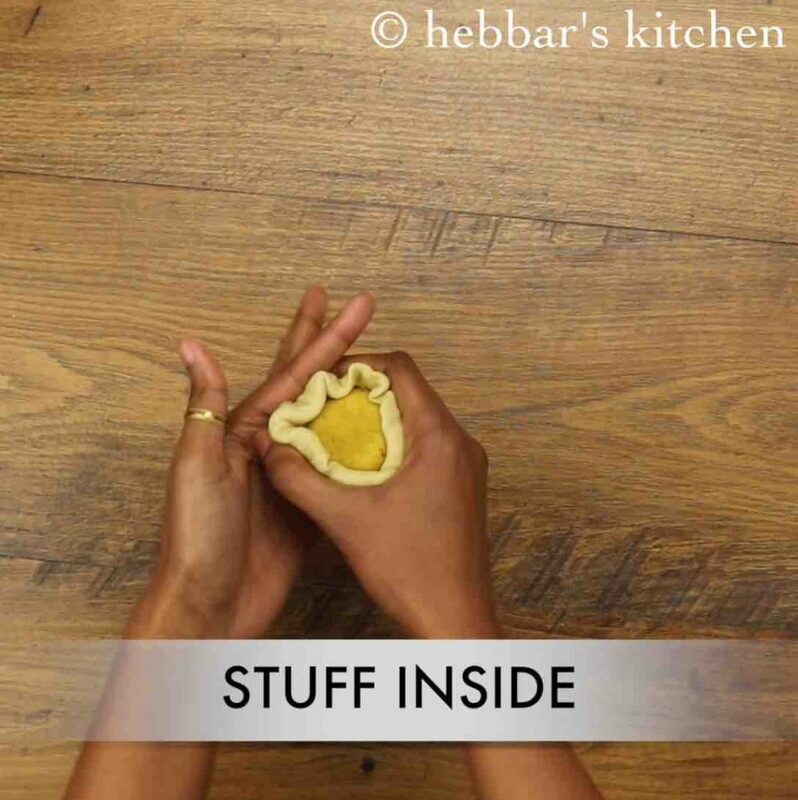 indian sweets are mainly targeted and prepared during the festival seasons like holi, diwali and ganesh chathurthi. moreover each state has its delicacy and sweets recipe dedicated for each occasions and celebrations. 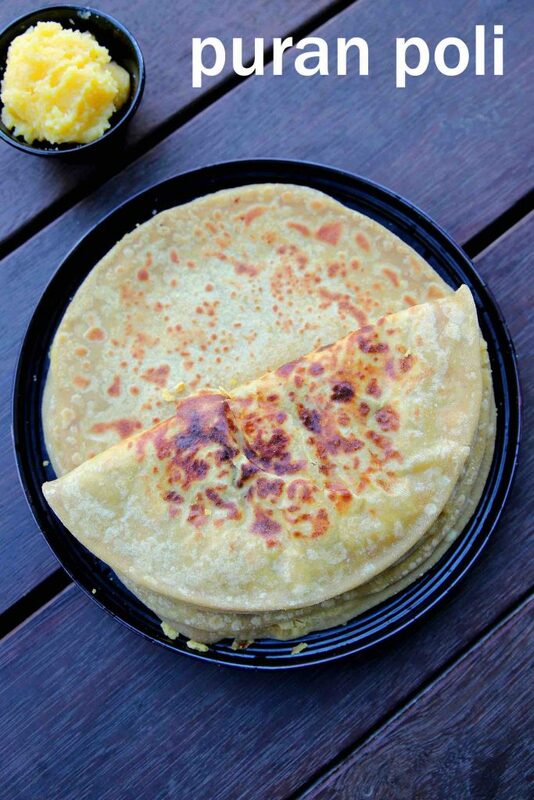 puran poli recipe hails from the marathi cuisine and is typically made for holi & diwali. there are many versions of poli recipes and i have already posted 2 versions of it. both these 2 versions belongs to karnataka cuisine and is mainly made with maida/plain flour with chana dal and coconut stuffing. but this version is completely different and i have made it with a combination of wheat and plain flour. 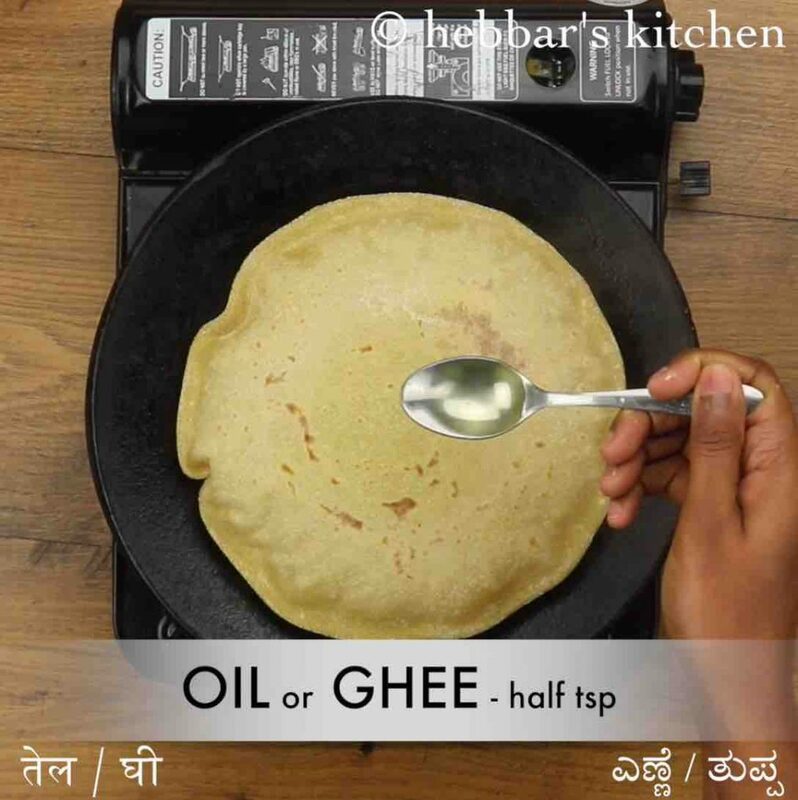 at first, you may easily get confused with any paratha recipe or dal paratha recipe. the texture and appearance is very similar but differs with stuffing. in addition, while the poli recipe from my home state karnataka is more sweet and thin compared to the maharashtrian version of puran poli. and hence, it may also be served for breakfast and not just limiting as a dessert recipe. 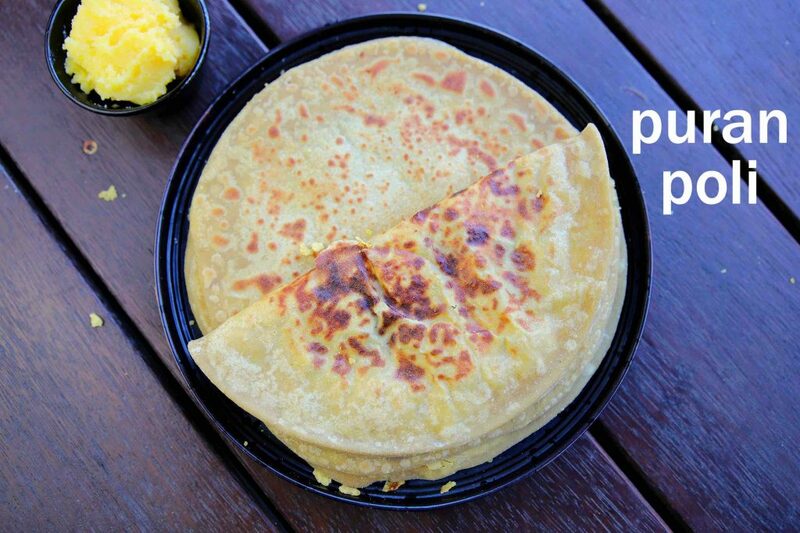 furthermore some tips, suggestions and recommendations for a perfect puran poli recipe. 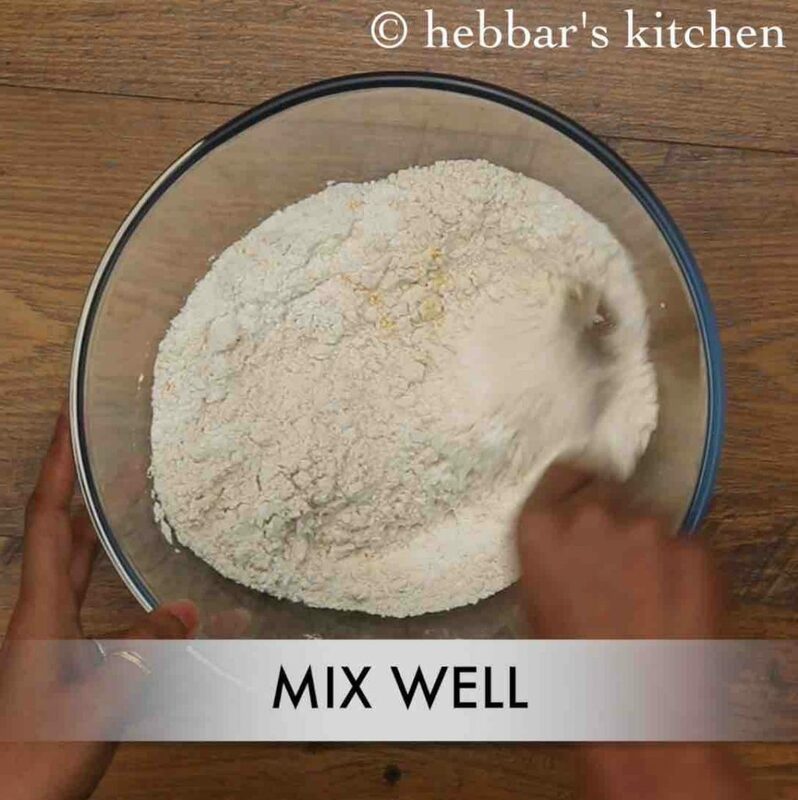 firstly,in this recipe i have used the combination of wheat flour and maida in a 2:½ ratio which gives a perfect texture to poli. 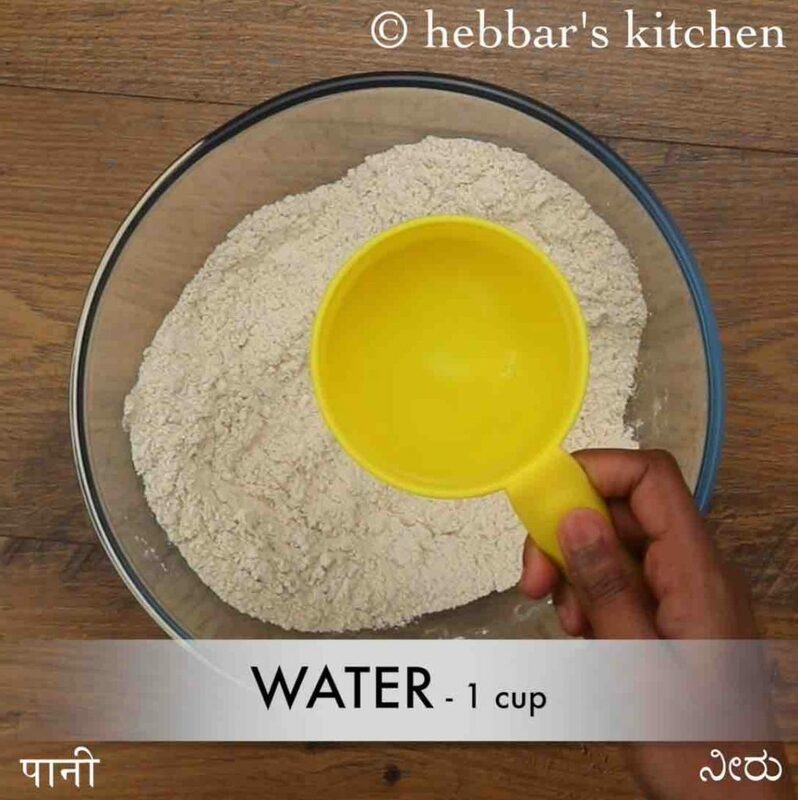 having said that, it can also be prepared with just wheat flour or maida flour. 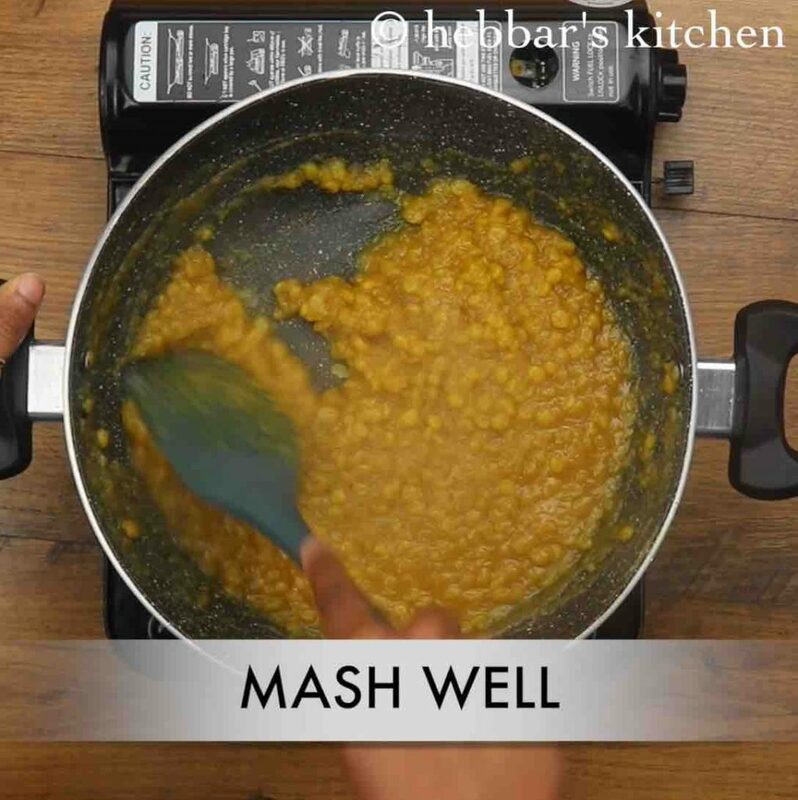 secondly, once the chana dal is cooked with jaggery, pass it through sieve to mash it uniformly. i would not recommend to use the masher to mash it as it may be uneven. lastly, the poli’s can be stored and preserved for 1-2 weeks in refrigerator. while serving heat it in microwave or in pan for 60-90 secs. 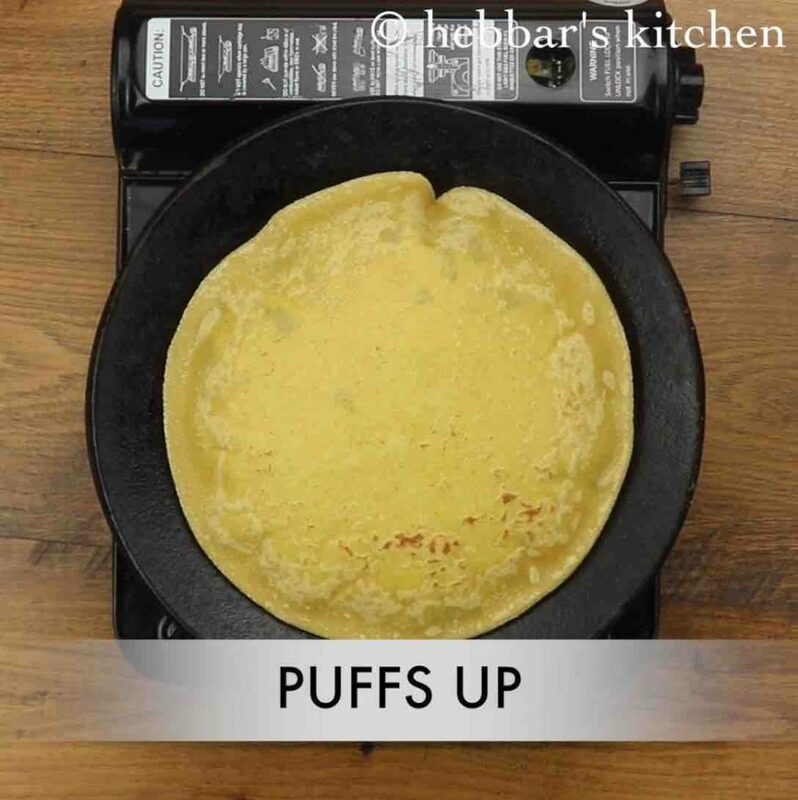 firstly, pinch a ball sized dough and flatten well. 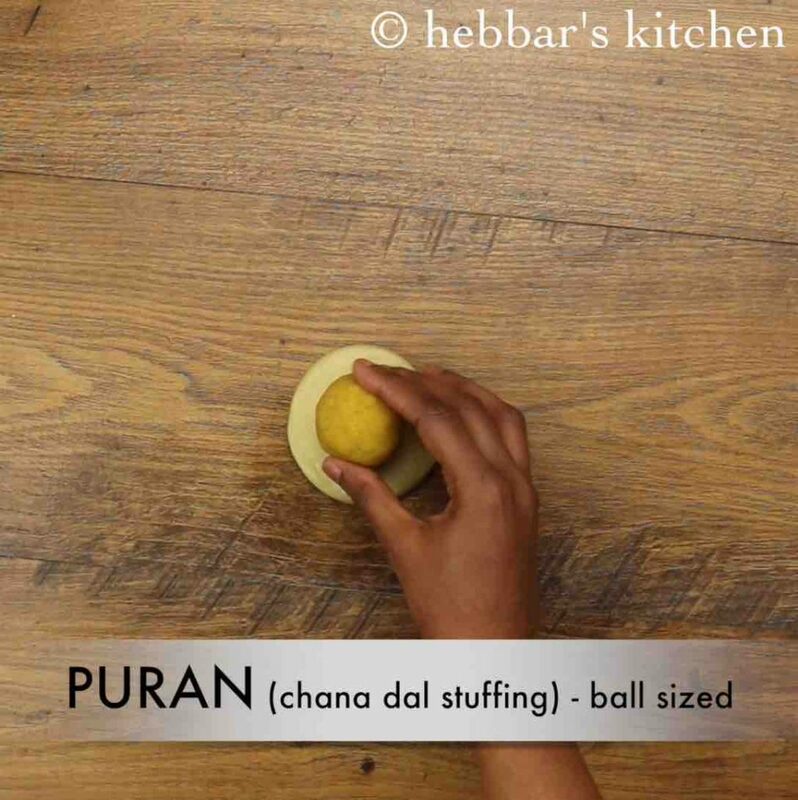 place the puran in center of dough. 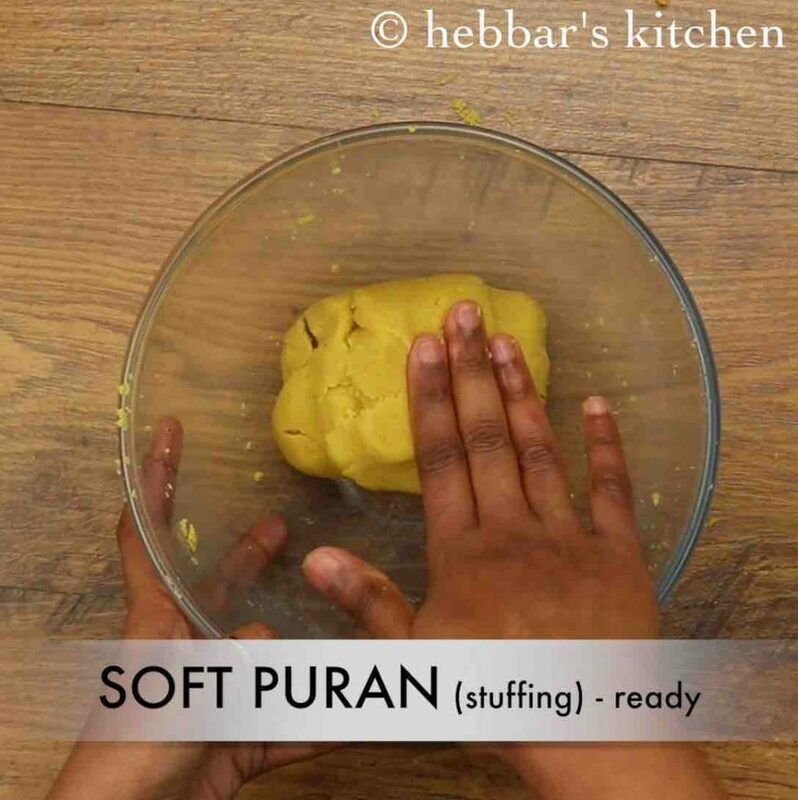 stuff the puran and pinch off the excess dough securing tight. 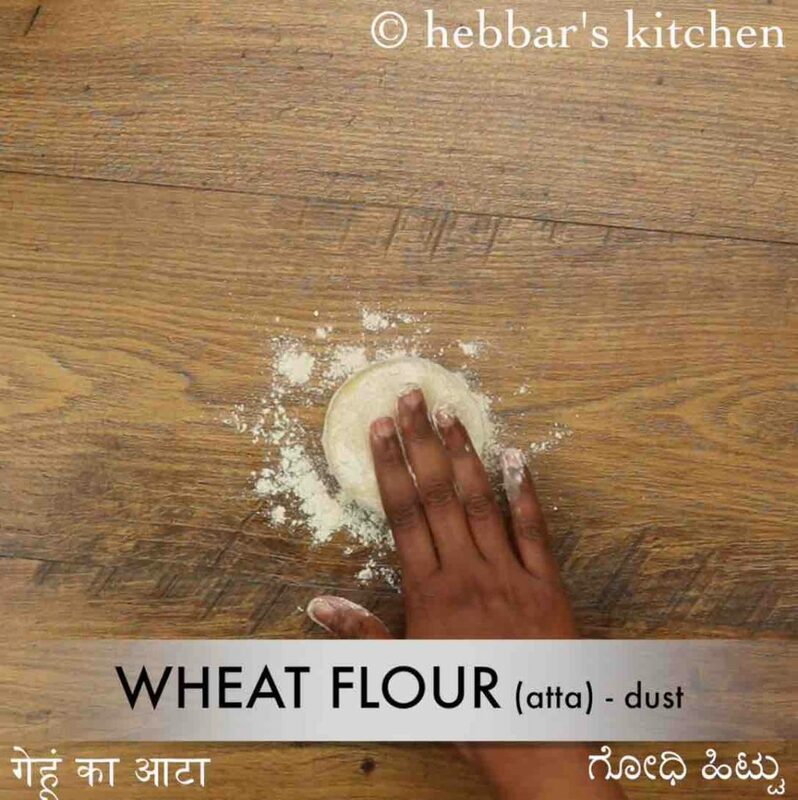 furthermore, dust the ball with wheat flour and flatten with hand. 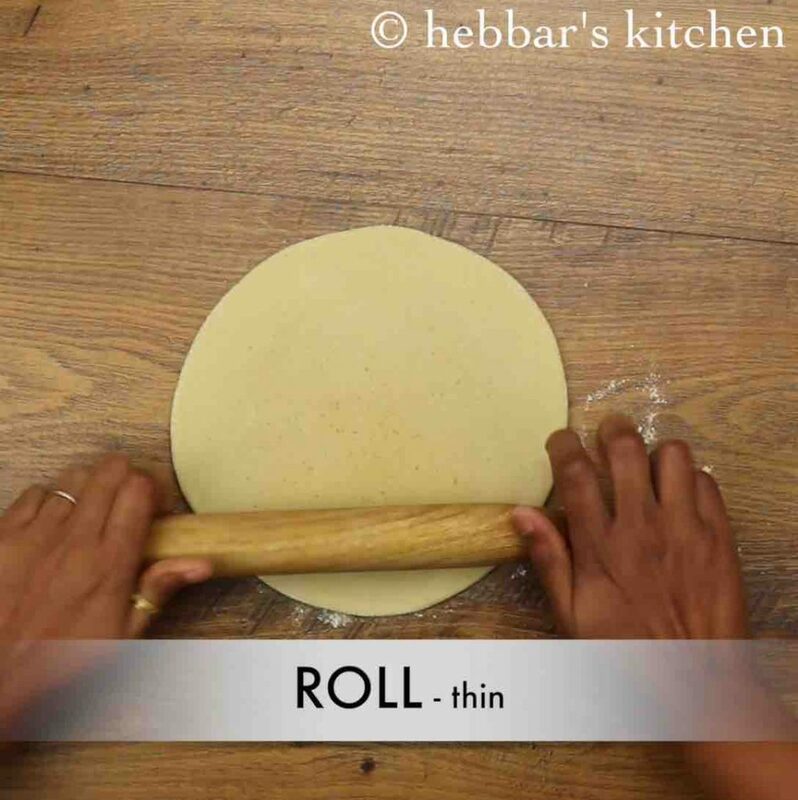 roll in one direction making sure the puran poli is thin. 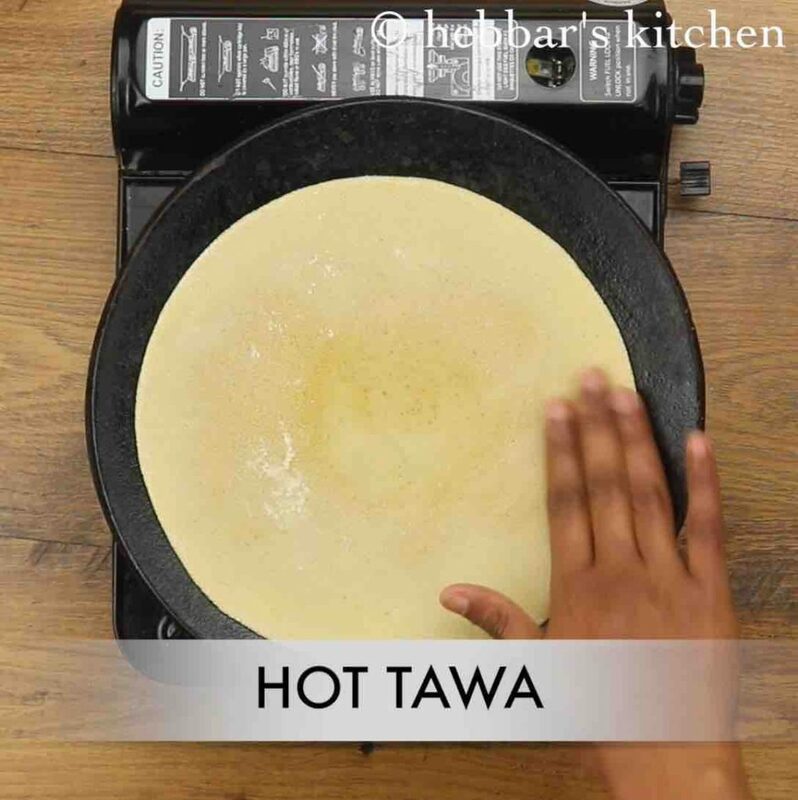 now put the rolled puran poli over hot tawa. allow roasting on medium flame until it puffs up. grease oil/ghee and flip over and cook both sides pressing slightly. 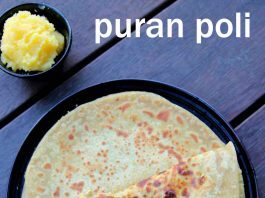 finally, serve puran poli with ghee. 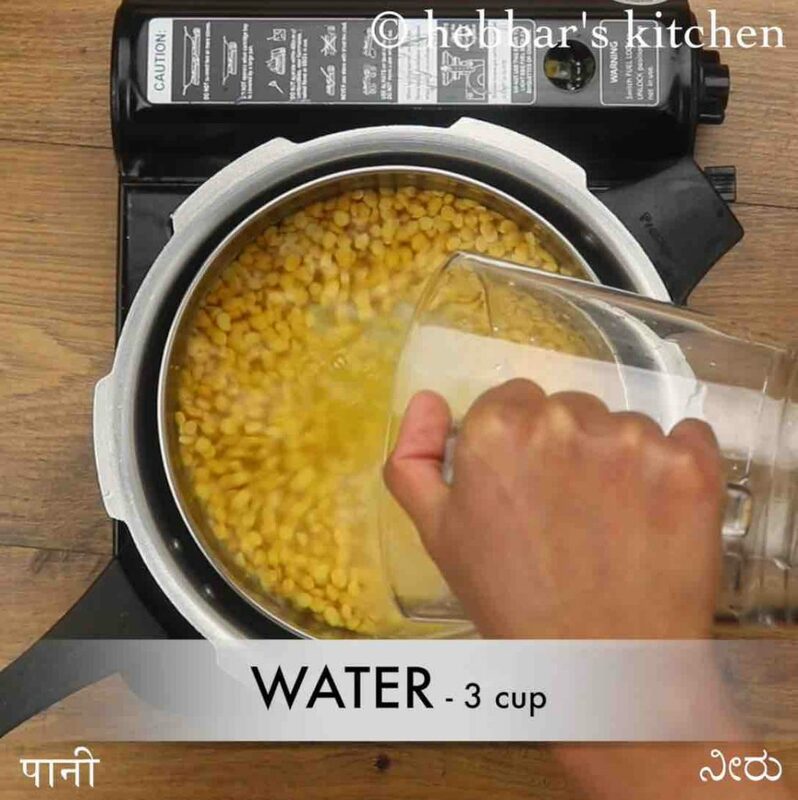 firstly, in a large bowl take 1 cup chana dal and soak for 3 hours with enough water. 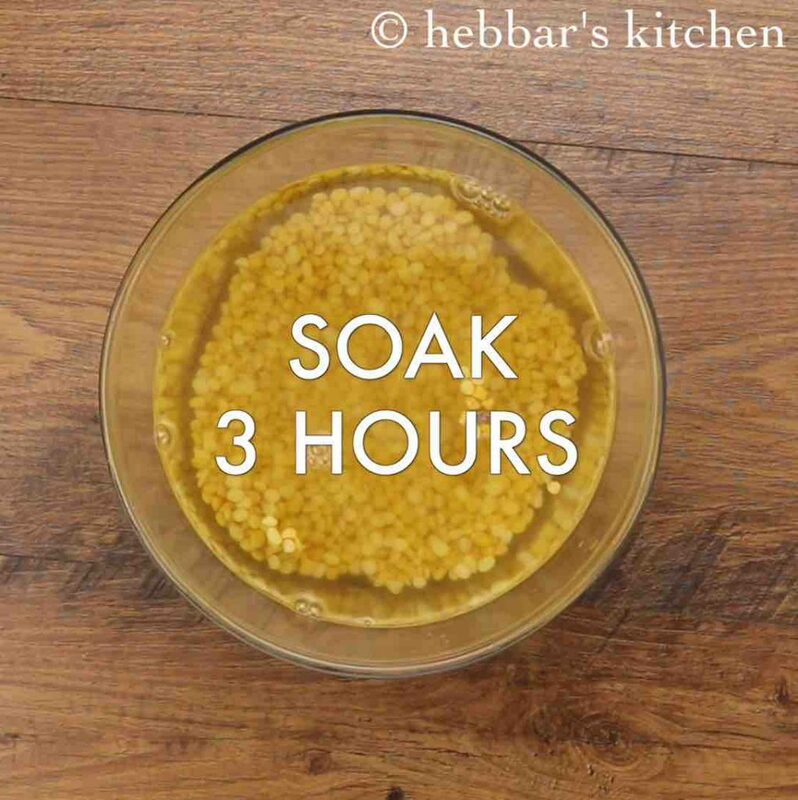 few chana dal just need ½ hour of soaking. 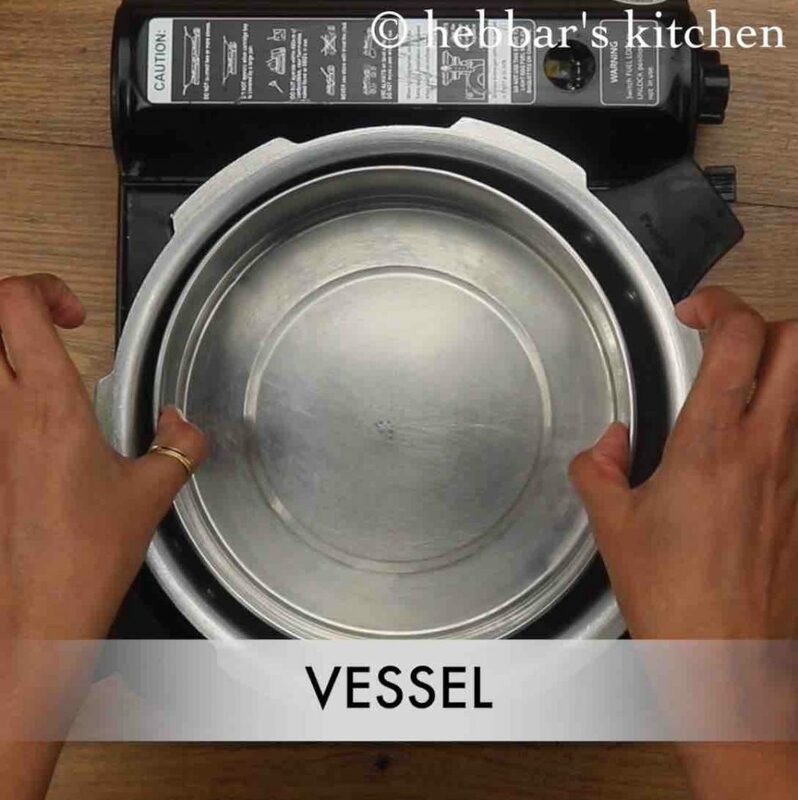 now in a pressure cooker, place a vessel pouring water at the bottom of cooker. 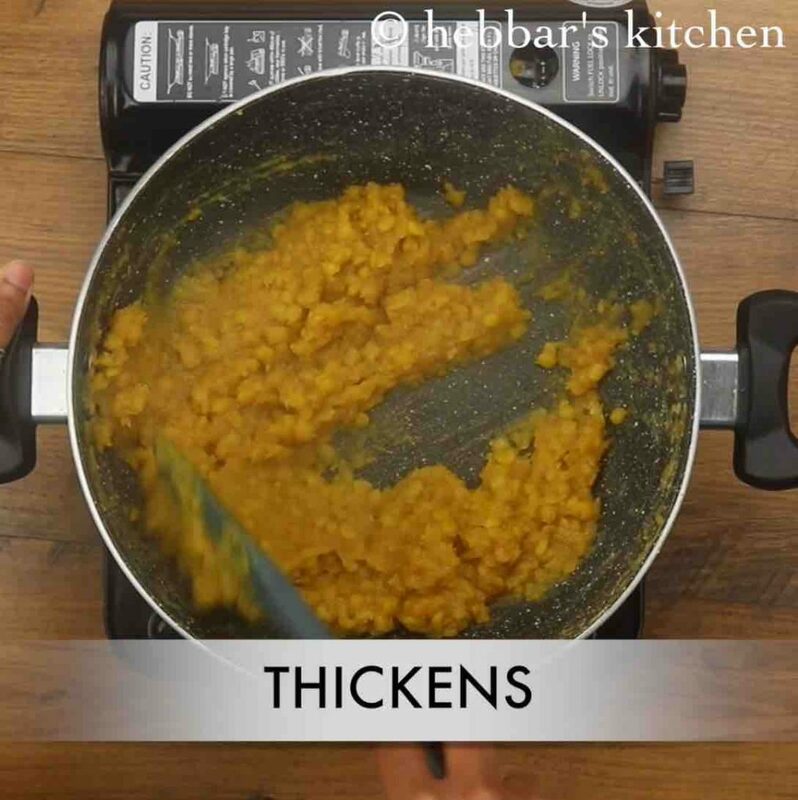 transfer the soaked chana dal along with ¼ tsp turmeric, ¼ tsp salt, 3 cup water and 1 tsp oil. 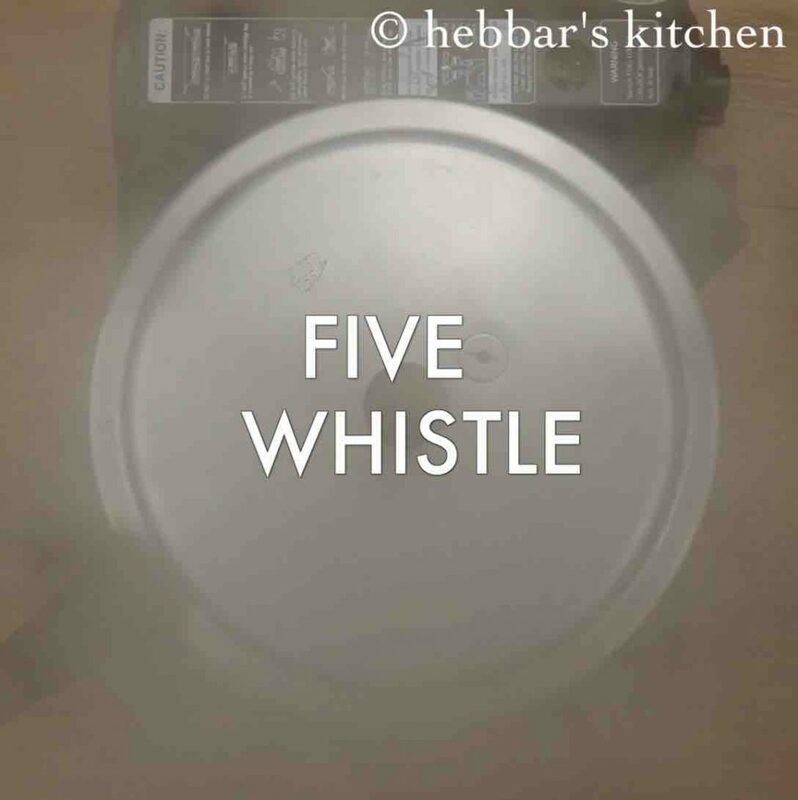 pressure cook on medium flame for 5 whistles. once the pressure settles down, open the cooker and drain off the water. 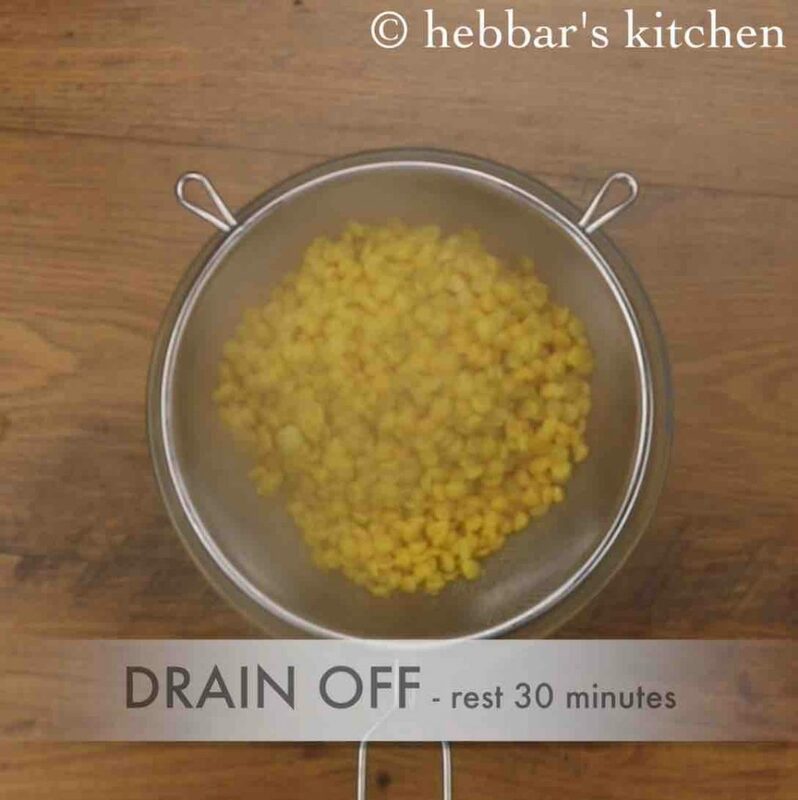 allow resting for 30 minutes, making sure to drain off all the water from chana dal. 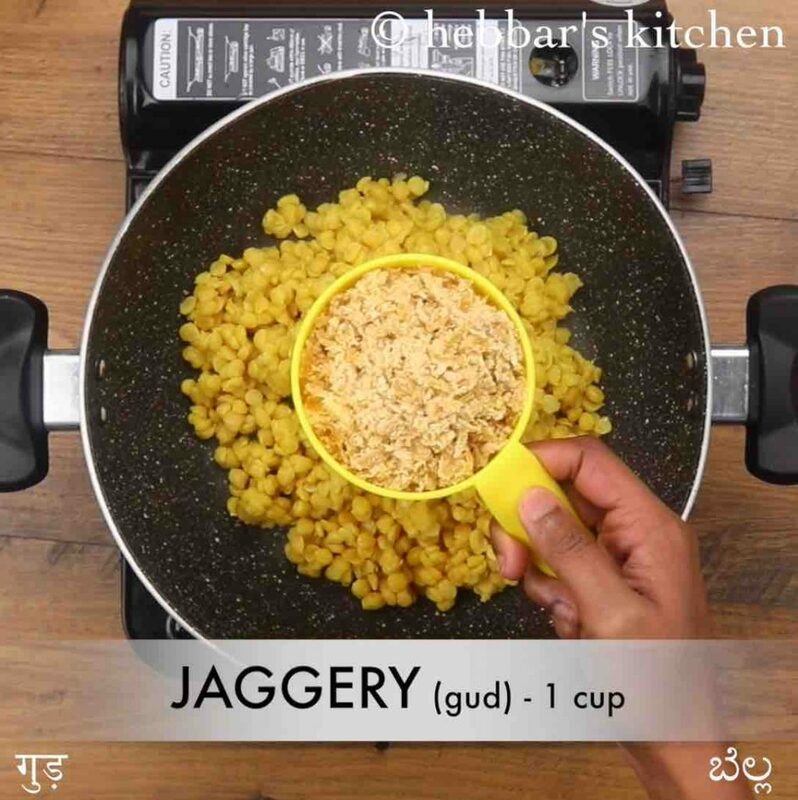 take cooked chana dal in the kadai and add 1 cup jaggery. 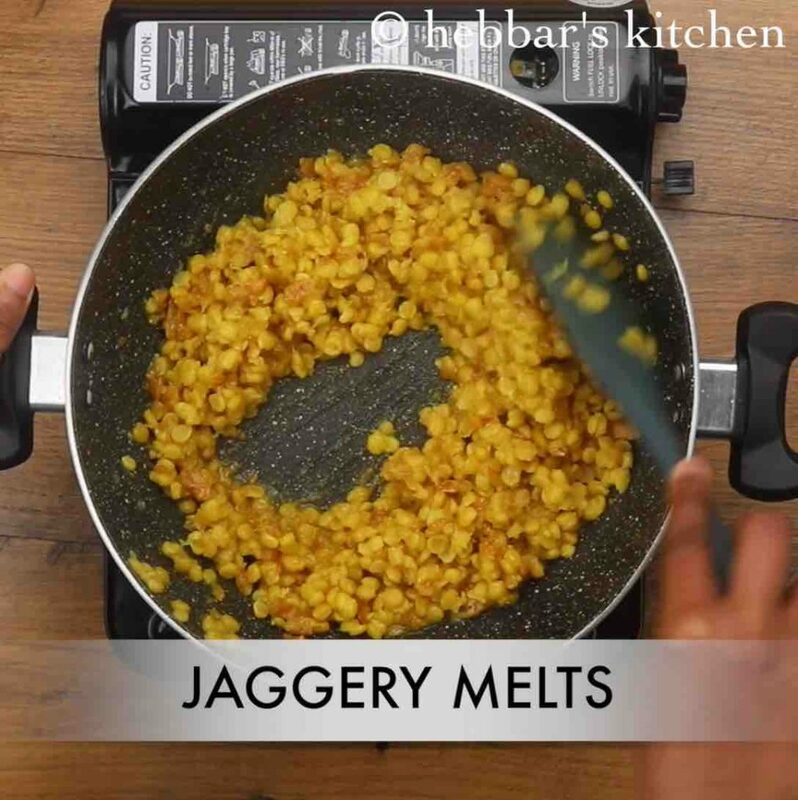 mix well until the jaggery melts. 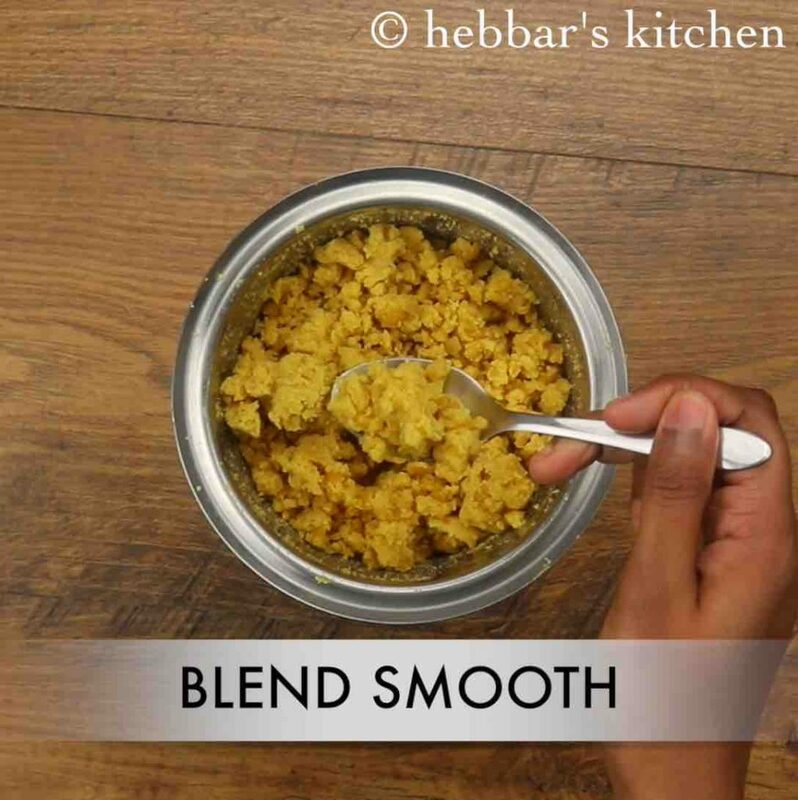 continue to mix by mashing the chana dal. cook until the mixture thickens and starts to separate from the pan. the mixture will start to hold the shape. 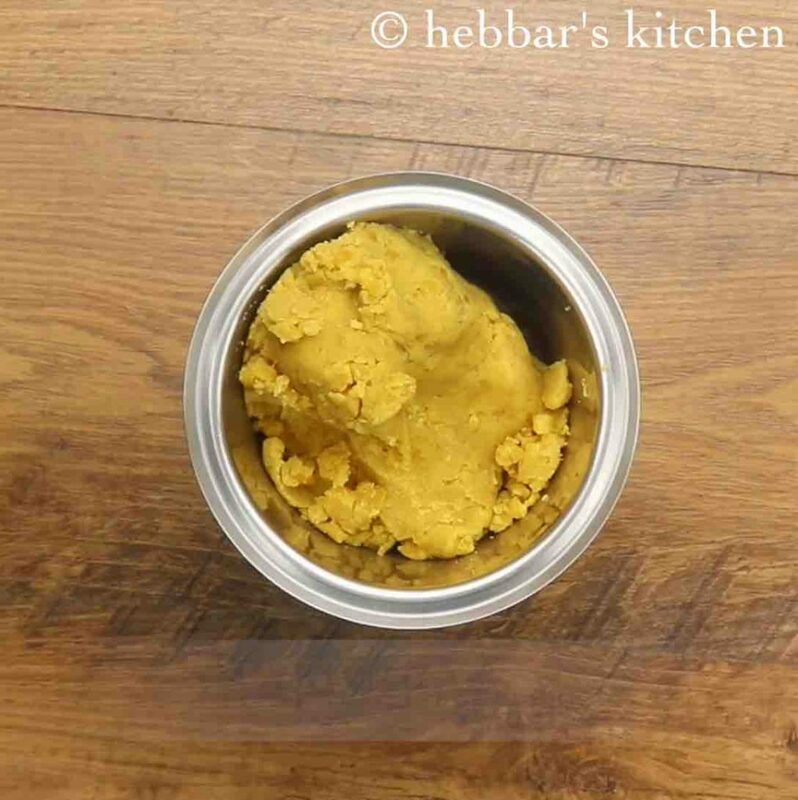 cool the mixture slightly and transfer the mixture to the mixi. 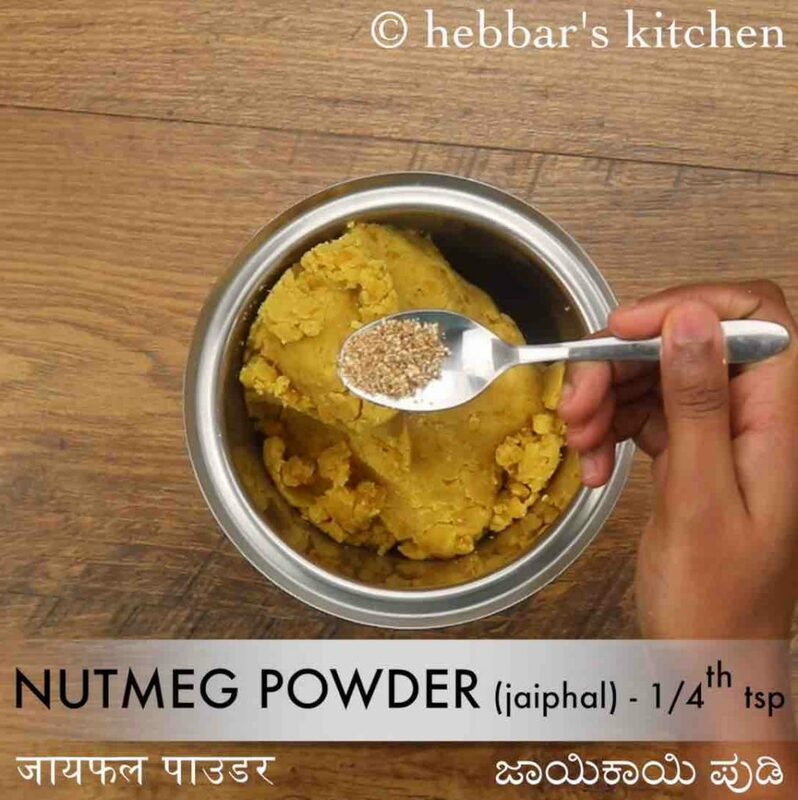 also, add ¼ tsp jaiphal powder and ¼ tsp cardamom powder. 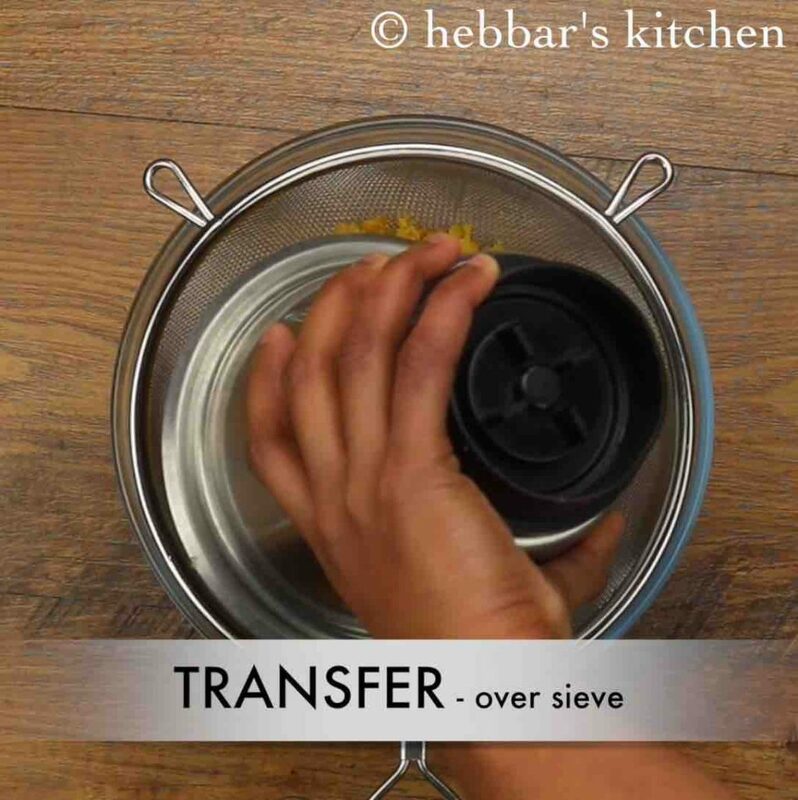 now place a sieve in a large bowl, transfer the prepared mixture. 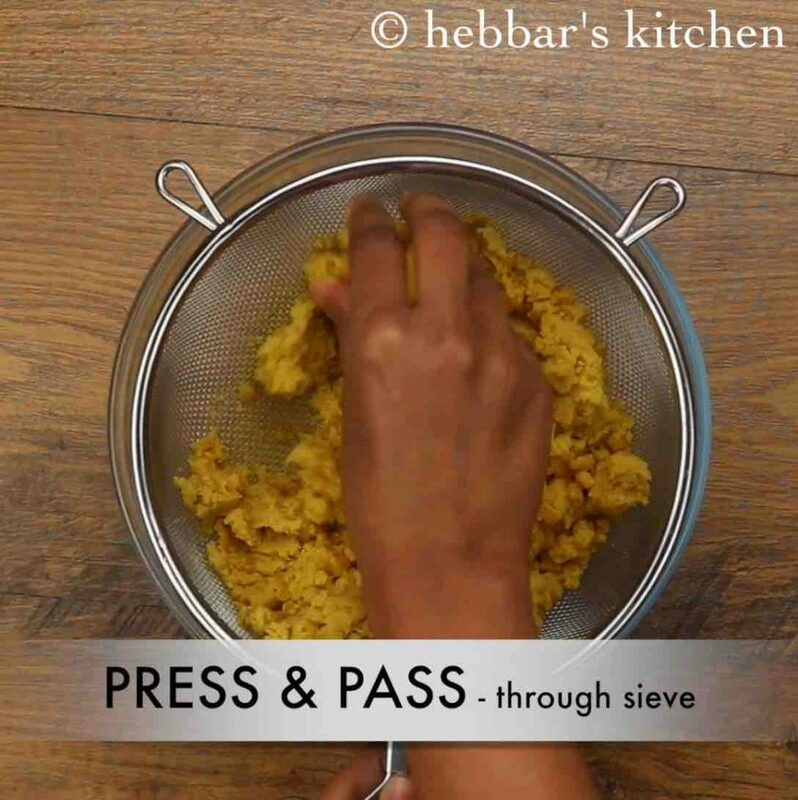 press and pass the chana dal mixture through a sieve. this helps to prevent any chana dal to be leftover. 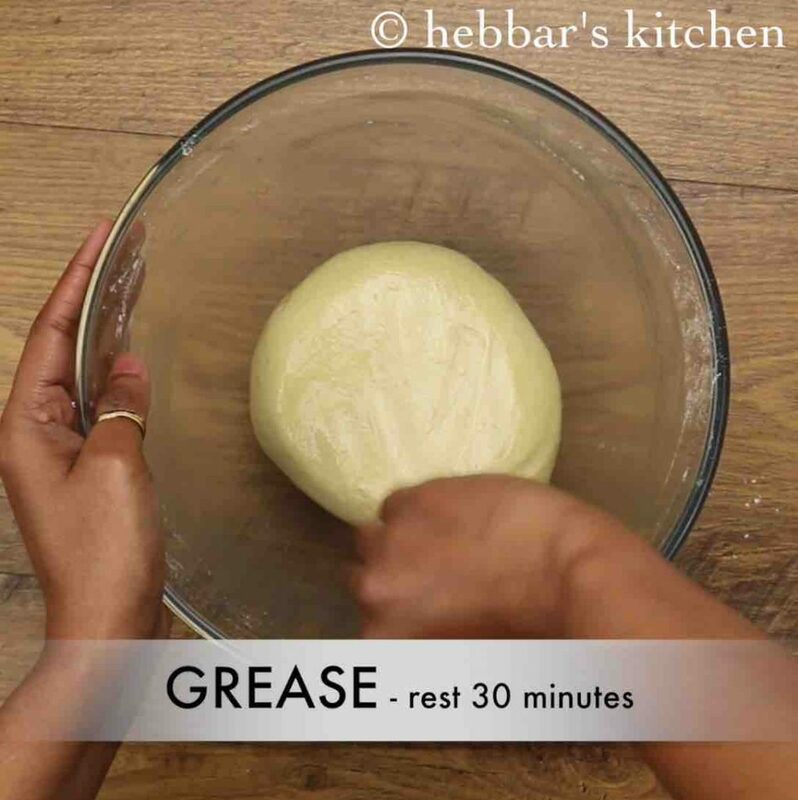 now mix and form a dough. puran is ready. dough preparation for puran poli. 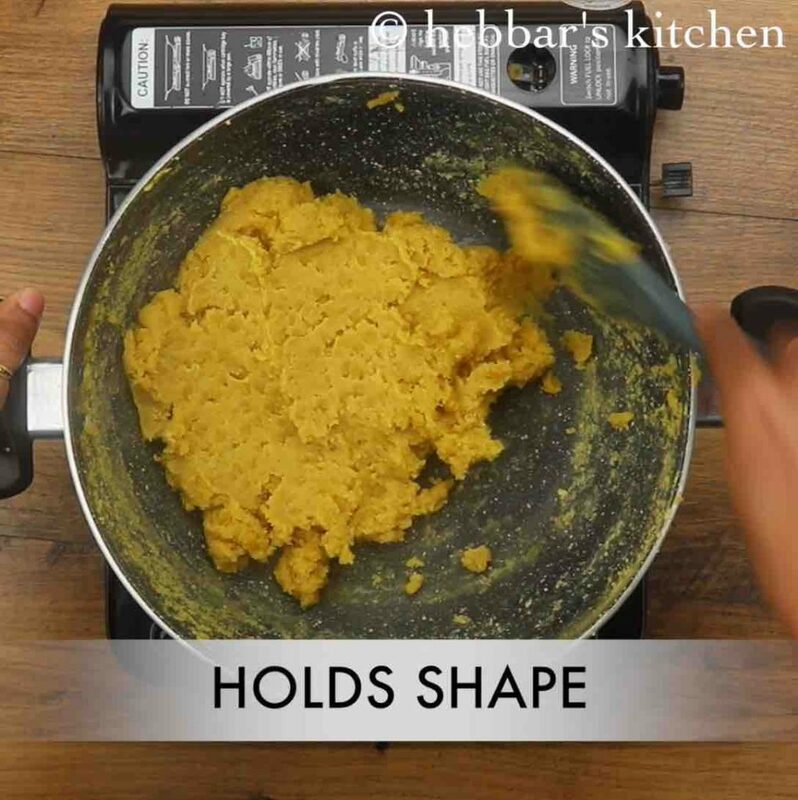 firstly, in a large mixing bowl take 2 cup wheat flour, ½ cup maida, ¼ tsp turmeric and ¼ tsp salt. now add water as required and knead the dough well. 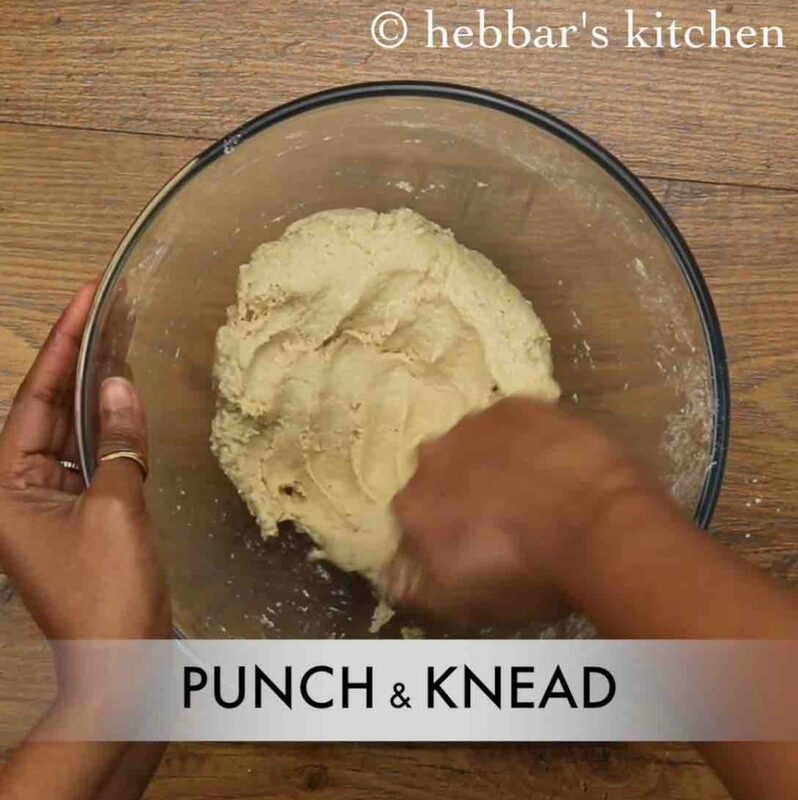 knead to smooth and soft dough punching well. 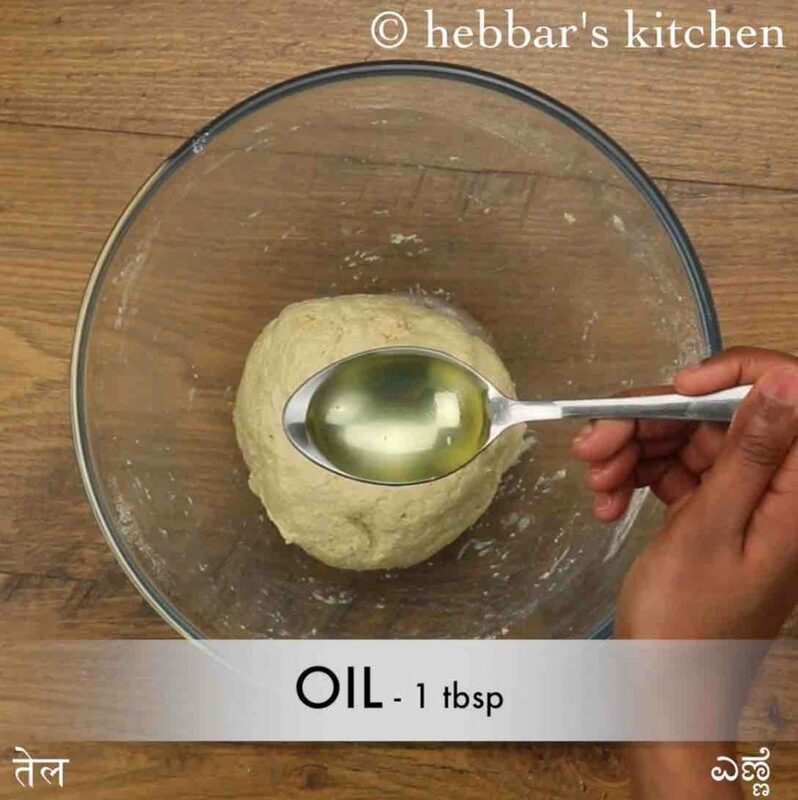 add 1 tbsp of oil and continue to knead the dough. 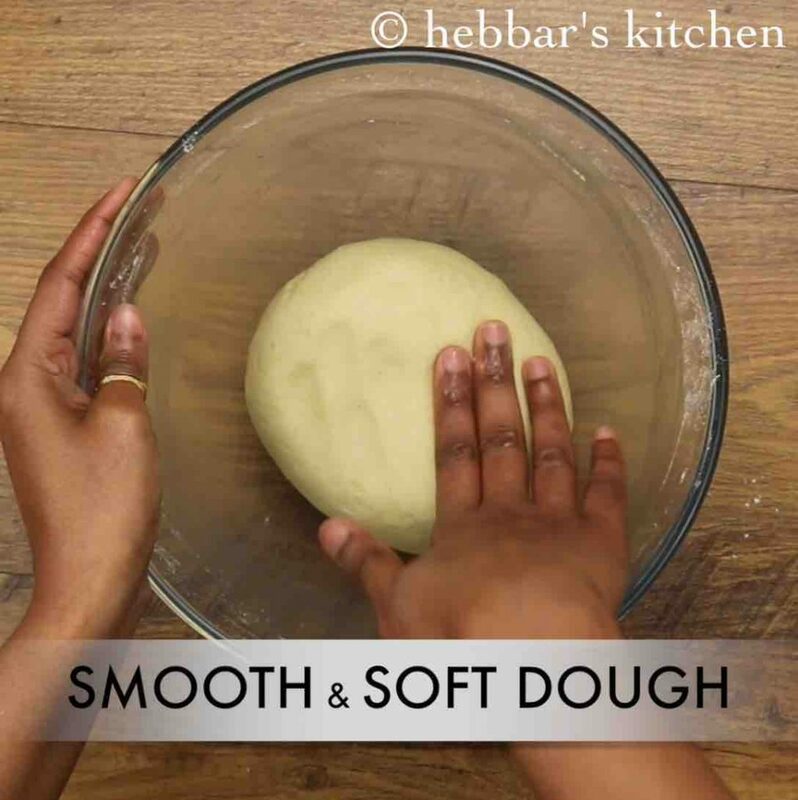 knead to very smooth and soft dough. further grease 1 tsp of oil, cover and rest for 30 minutes. 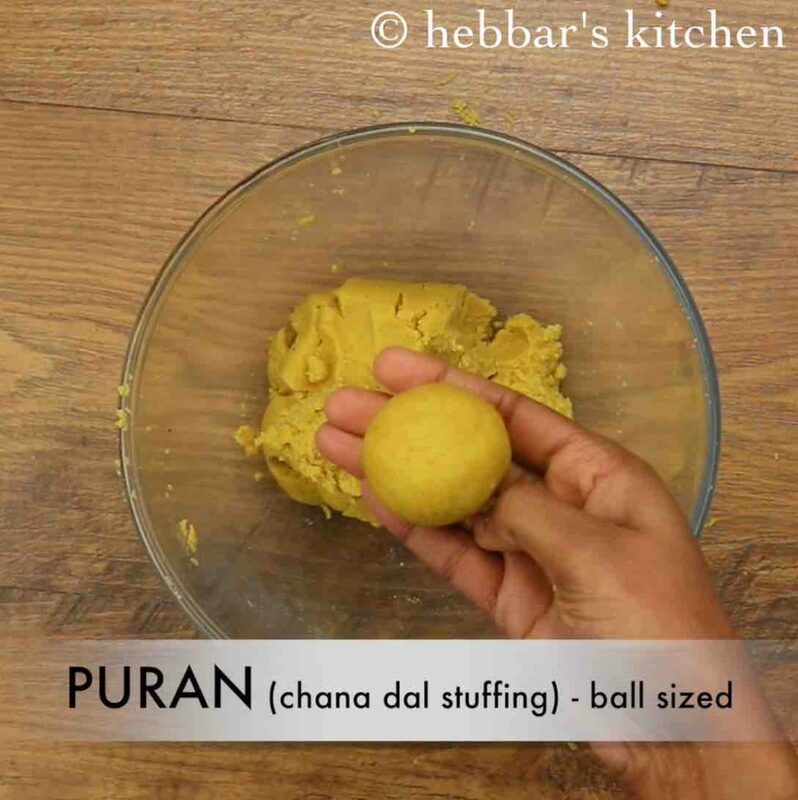 place the puran in centre of dough. 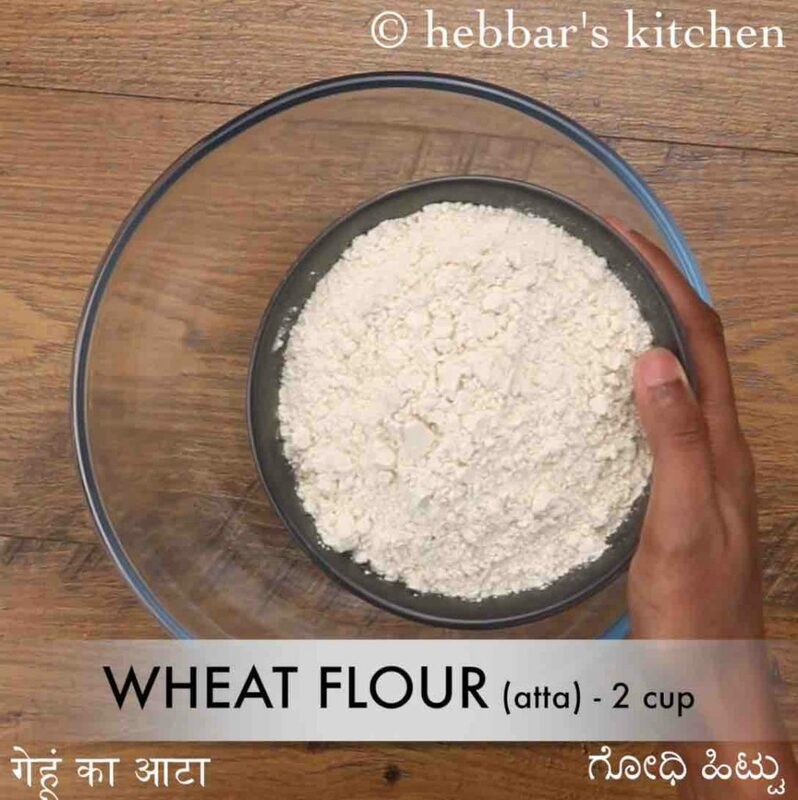 firstly, use just wheat flour or just maida to prepare poli. 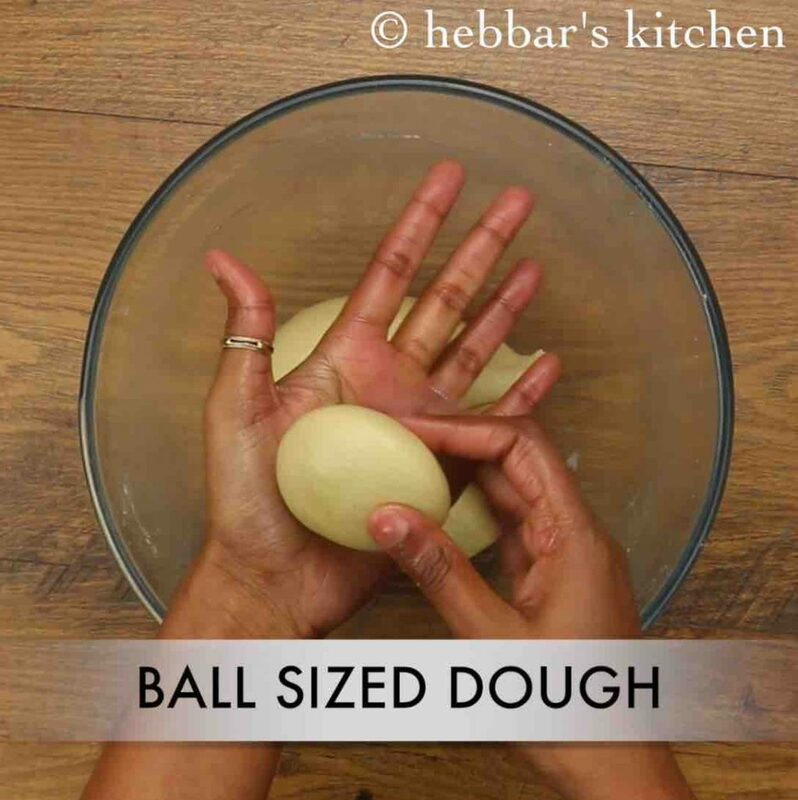 also, adding oil while kneading dough, makes dough very soft. additionally, make sure there is no chana dal in the stuffing, else it will be difficult to roll puran poli thinly. finally, puran poli / holige / obbattu stays good for a week or more when refrigerated.